My first set of projects only uses the FREE extra products and the Starter Kit suggestion list at the end of this post, this set is tailored towards new paper crafters or those wanting a complete, coordinated suite of products that they can create with straight away. This card is CASE’d from the Annual Catalogue (page 118) and is perfect to make in bulk. A standard card base was covered with a piece of Be Merry DSP (10 x 14.8cm) and a swish of Cherry Cobbler Double Stitched Ribbon added to the centre. The sentiment was stamped in Garden Green ink on a 6 x 6.5cm piece of Thick Whisper White and then layered onto a 7 x 7.5cm Cherry Cobbler and 7 x 7.5cm Garden Green cardstock and popped up on the card front with dimensionals. A super quick and easy card to start off with, with plenty of room to add more embellishments if desired. These cards have an extra layer of cardstock 10 x 14.3cm in a contrasting colour to the base and added to this are two strips of the Be Merry DSP that measure 10 x 10cm and 3.5 x 10cm with a small gap between. The Cherry Cobble Double Stitched Ribbon was tied around one end with a knot and this layer was attached to the base with a Tombow Multipurpose Glue. TIP: The ribbon has a different pattern on each side, to have the crosses uppermost I twisted one end when I was finishing the knot and used Glue Dots to keep the ends facing the direction I wanted them. The sentiments were stamped in Momento Black ink on Thick Whisper White and again in Cherry Cobbler on a scrap piece. The centre portion was trimmed and flagged and attached to the main sentiment with dimensionals. This was layered onto Cherry Cobbler cardstock and popped up with dimensionals on the front of the card. The final card is a simple Z-Fold card. To create this fold start with a standard card base and add an extra score line 1-1/2″ from one edge and fold in the opposite direction. Make sure to burnish your score lines well to help it sit nicely. Three DSP panels were added measuring 10 x 14.3cm (inside), 6.1 x 14.3cm (front) and 3.3 x 14.3cm (front) with an even border around each piece. Deck the Halls was stamped on a 6 x 7cm piece of Thick Whisper White and layered onto a 6.5 x 7.5cm piece of Cherry Cobbler. This was attached to the front panel using Tombow. TIP: Mark and put the glue on the panel only, this will ensure the sentiment is only attached to this part of the card. 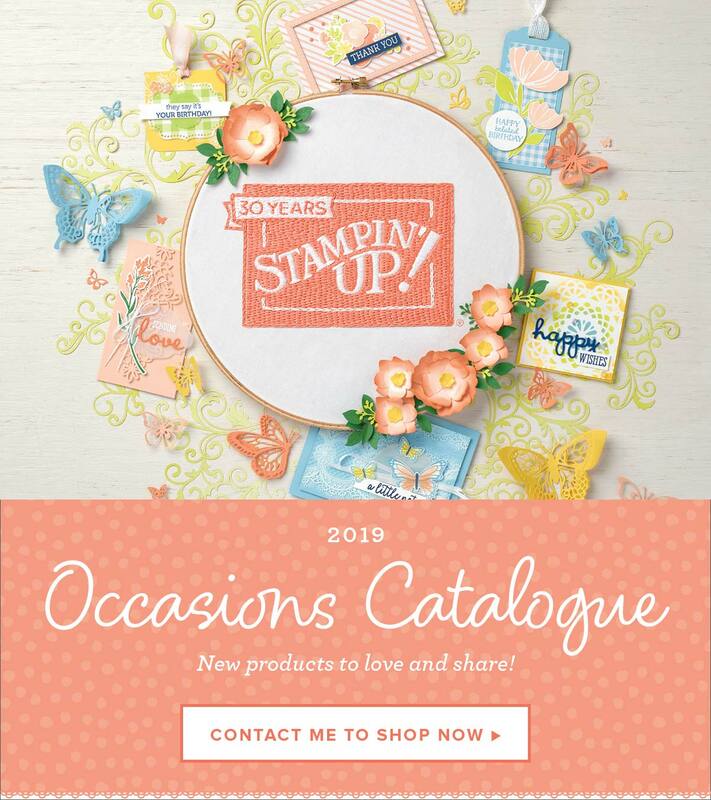 Note: When you join Stampin’ Up! you get to choose a Starter Kit of product worth $235, the following list is just a suggestion that includes all the products used to create todays cards and a little more. However, you can choose anything from the catalogue, current preorder and clearance rank to create the perfect Starter Kit for your needs.